Skateboard photos by Tim Knutas. Brotherhood Plaza is the first big skate plaza plaza project in Sweden with more than 20000 square feet of asphalt, grass gaps, bushes, trees, curbs, banks and hips that do not at all look like your average skatepark, more like real suburb or small town street spots. As of now there are 20 times as many spots that has been drawn than the ones that have been built, due to funding. The goal is to raise about $ 1.000.000 to 4.000.000 and meanwhile the skaters has ambitions to build more spots themselves. You can also gain an impression about the vision of how to extend Brotherhood Plaza in the future. 1. A halfpyramid-like construction with pavement surface and a tiny grass gap in the hip. 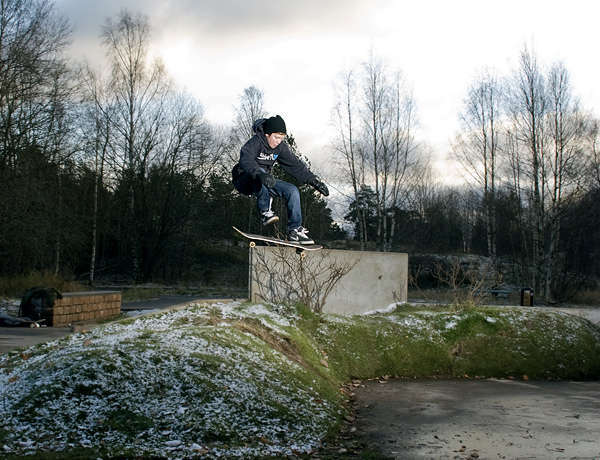 It has a 10 cm narrow, 2 meters long concrete curb over the halfpyramids grass gap platform (see attached pic, popshove noseslide, photo Tim Knutas, rider David). From the pyramids banks you can also clear a grass gap with bushes and land flat behind the half pyramid. 2. A grass threestair with 2 grey and sand colored rustic brick, granite topped, curbs in different heights leading over a grass gap (2 meters long, two different heights). 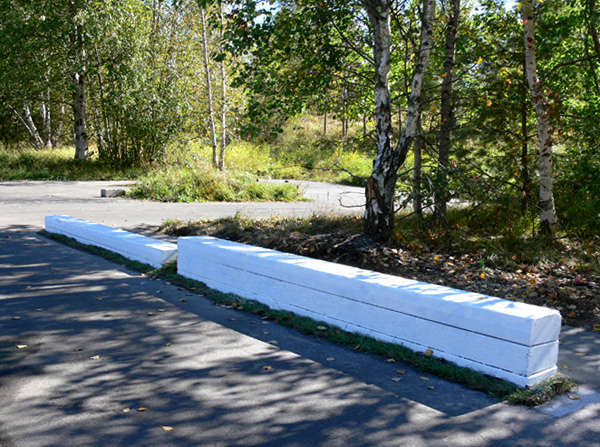 When we add an isle over the grass gap a couple of meters from there, those with good pop will be able to skate the curbs from the low end and up too, except for like now, only going from the "platform" and out. 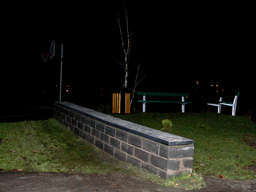 The brick pattern on these curbs are different on each side to add variation to skate pics/clips shot there. 3. 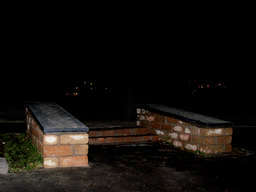 A twostair with 2 red sand colored rustic brick granite topped ledges, skatable down and up the stairs (2,5 meters long). 4. 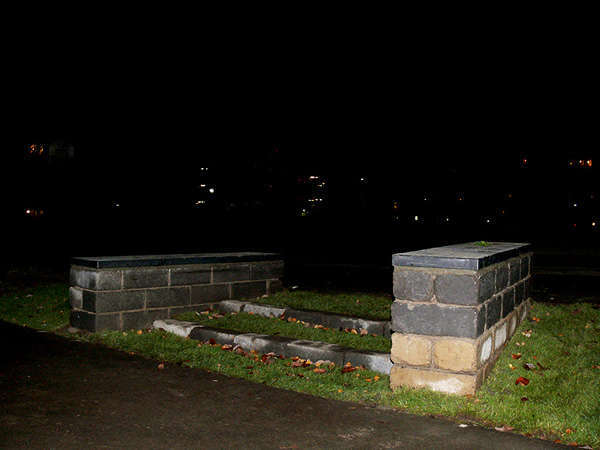 One red sand colored rustic brick granite topped flat curb over a 5 meter flat grass gap, for the more advanced skaters for demos, photo shoots and some challenge. Everyone can learn to use as a manual pad or to do ollie up and tricks down the other side though. One side of the curb is light grey non rustic bricks so taking pictures from one side it looks like one curb and from the other side it looks like another curb. On the grey side we will do gaudi-like crushed tile mosaic to make it look even less like a skate park, hopefully in 2008. 5. There is another 5 meter curb going down a mellowly leaning grass gap. This one also has granite top. Since its leaning its easier to slide or grind this one than the flat one because you don't need that much speed, but its still a good challenge. The plaza also contains two 2,5 meters long, 20 cm wide concrete curbs/slidebars (see the pic, white ones). 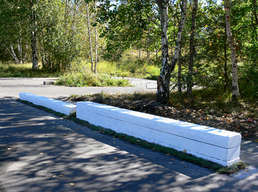 They are placed after each other with a small gap with a 20 cm long, 10 cm high "grass gap" in the middle, so that you can do boardslide-gap-boardslide, 50/50-gap-tailside etc. both up and down the little gap. The little string of grass along it is thin enought not having to pop out not to get stuck, but still adding some nice "non-park-feeling". Where you pop on and off most curbs there are tiny grass gaps like this, small enough not to get stuck in them (5–35 cm depending on placement), but still taking away even more of the skate park feeling, especially when the grass grows longer. 7. There are lots of flat grass gaps from 4 cm long to 4 meters long. 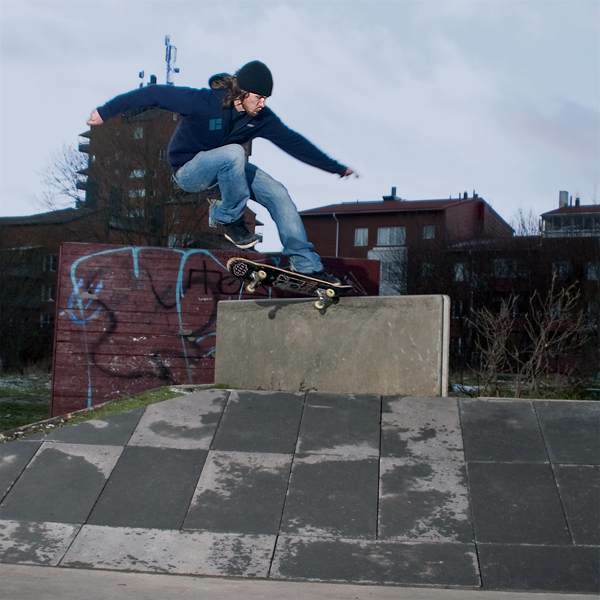 See the backside heelflip pic of Appe (Andreas Olsson) for one of them. This grass gap in particular is partly covered by the small euro-gap-like-thing now, but there are still lots of grass gaps. 8. A movable flatbar that can be used over the different gaps to add variation until we build a lot of different rails. 9. A flat 1 x 1,2 meter metal sheet that can be used as a makeshift jumpramp/bank by putting loose bricks underneath it until you get the steepness you prefer. Then you can ollie over gaps, garbagecans or up on ledges, ollie over the grass and into the banks from the back of the pyramid etcetera. See pic of the sheets used for the trashcan. 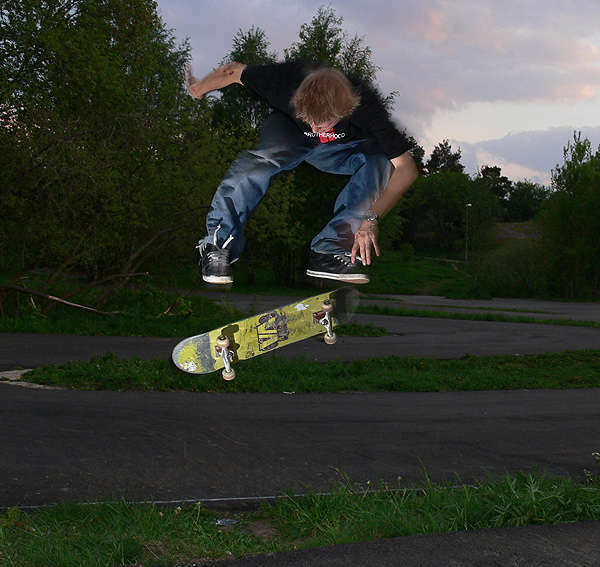 Photo Tim Knutas, skater David. 10. Big loose rustic bricks that can be uses as ollie obstacles. Small, with an adjustable pole jam up or down it. Portable flat rail that can be used over the grass gaps. 11. A tiny euro-gap-like thing (50 cm–1 meter long depending on where you hit it, and only a few cm high). The mellow bank is made out of pavement blocks. The gap will be filled with low bushes, flowers and things like that. Fun to do flips over and into the bank. 12. So far loose polejam pipes that can be used up the eurogap or over the regular grass gaps. Some authentic looking colored ones will be fastened at authentic looking places later. 13. A rough little asphalt bump. Hard one to skate with pop, but easy for kids to practice just learn to ride over and do small jumps. And if you set your mind to it you can put barrels or a bench or something behind it, but its quite hard. 14. If hammer skaters come around there is 2,5 meter high container skate off of. While walking to the plaza you will pass a well known little curb called the Skarpnäck curb. 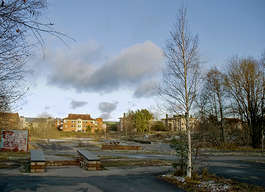 Skarpnäck also has Stockholms widest outdoor miniramp (about 5–6 feet high and maybe 25–30 feet wide). Diskussion about skate spots in the spots forum.